Some explosions shook Syrian Arab Army positions in Aleppo and Hama provinces early Monday morning in what was widely reported to have either been an American, Israeli, or other Western allied strike on alleged Iranian military positions in the country that supposedly killed a few dozen people. It’s unclear exactly what took place because Israel won’t comment on its participation in the latest events, while unnamed sources in Iran told the national Tasnim news outlet that no attack even happened despite video evidence of the explosions. Ominously, the Israeli Defense Minister warned right beforehand that his air force will continue to operate freely over Syria’s skies in spite of Damascus promising to defend itself and having previously shot down one of its neighbor’s jets in February. Netanyahu had also been making a big deal about what he alleged were 80,000 Iranian-backed fighters amassing in the Arab Republic, so circumstantial evidence points to Israeli involvement in what appears more and more likely to have been an actual attack. Whether it was Israel, the US, or their allies, whoever carried out this bombing – if that’s indeed what it actually was – ended up proving a few points. 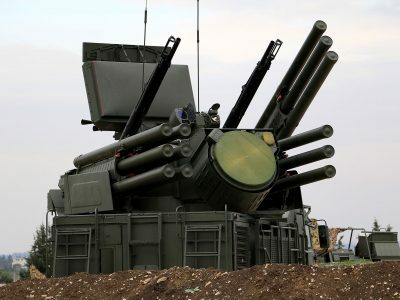 The first is that Syria’s Soviet-era air-defense systems aren’t as effective as they were portrayed as being last month when they supposedly shot down most of the US, French, and British cruise missiles, drawing into question exactly what happened back then if they weren’t able to repeat their success this time around. Having acknowledged that, it’s improbable that Russia would be okay with Israel dropping a “tactical nuke” on Syria like what the viral fake news reports from some Alt-Media outlets are claiming, meaning that the 2.6 magnitude earthquake that followed the supposed strikes was probably triggered by a thermobaric or fuel-air bomb and not anything radioactive. Given Russia’s very close relations with Israel and its excellent ones with Iran, however, there’s a chance that Moscow could serve as a regional “balancer” in attempting to bring both sides together just like it might be trying to do through its interlinked Eurasian Union free trade deals. Russia’s de-escalatory role will therefore be pivotal in determining the future of the proxy war between the West and Iran over Syria, but Moscow might ultimately have to “lean on” Damascus and “convince” it to make some “compromises” on Iran and Hezbollah’s post-Daesh military presence in the country if there’s to be any real chance of preventing these tensions from spiraling out of control.